1 It doesn’t have to be like this! Most other wealthy countries share out their wealth more fairly. We used to do the same, but over the last 40 years we’ve allowed the super-wealthy to get richer and richer, while the rest of us get poorer. 2 It’s bad for all of us. Countries with big gaps between rich and poor are miserable places to live. They have the highest rates of crime, violence, mistrust, mental illness, suicide and incarceration. Fairer countries are happier, healthier, safer places to live. 3 The poor are treated differently from the rich. 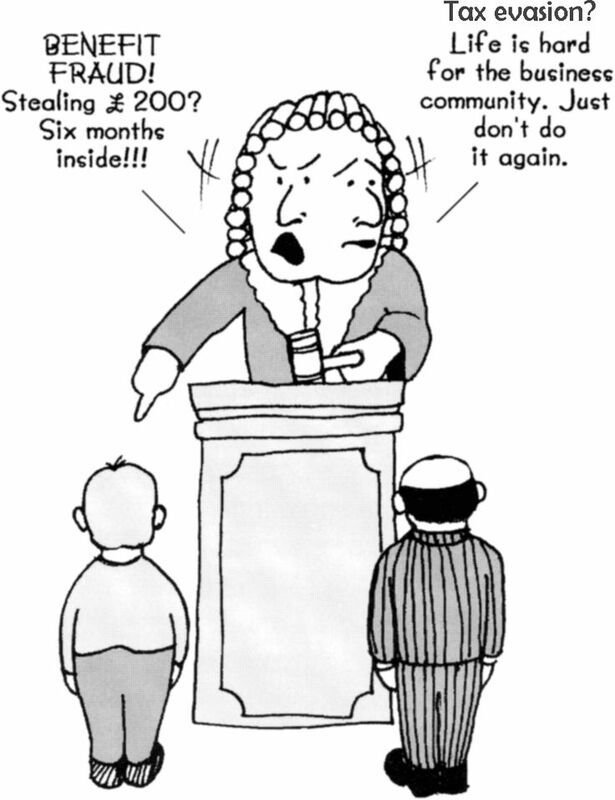 Benefit fraud, committed mainly by people on very low incomes, costs the UK £1.5 billion a year. Tax avoidance and evasion, committed mainly by very wealthy people, costs us at least £35 billion a year. So why are there so many newspaper articles about ‘benefit scroungers’, and so few about tax dodgers? And why is HMRC sacking tax collectors rather than collecting the missing tax? 4 High pay for fat cats hurts the rest of us. Companies which pay a Living Wage, and have fairer ratios between top and bottom pay, perform better. And better pay for the lowest paid is good for us all, because they spend their money and boost the economy. Whereas the wealthy are more likely to keep it in savings – or even in an offshore bank account. 5 It costs money to be poor! People on low incomes get ripped off and exploited every day, by businesses which know that people in poverty have fewer choices about where they buy goods and services. They pay more for food, for fuel, for finance, for furniture, and even for funerals. 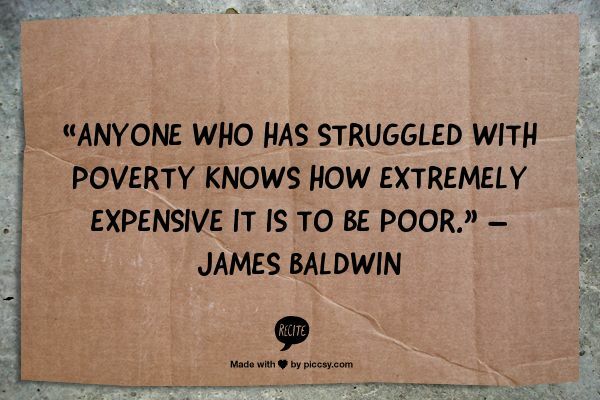 It’s called the Poverty Premium, and it costs the average low-income family £1,300 every year. 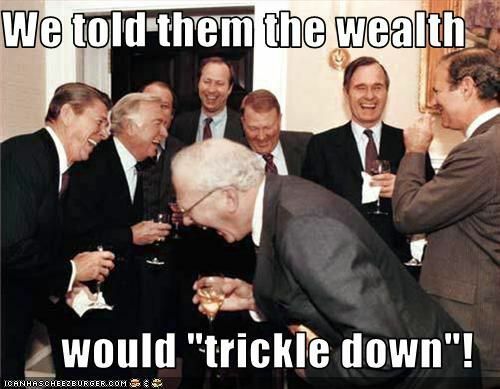 We’re told that it’s OK if the rich get richer, because eventually the wealth will ‘trickle down’ and benefit the rest of us. The rich have been getting richer for over 30 years. 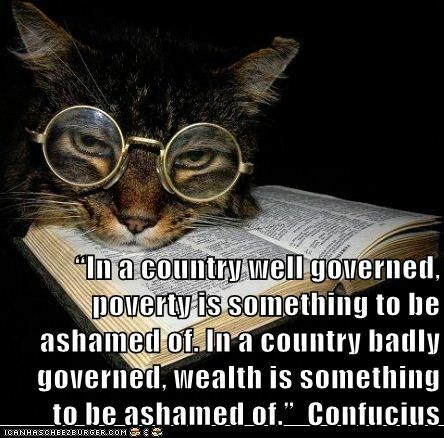 The poor are getting poorer. The wealth is being sucked up, not trickling down. 7 It makes this cat grumpy! 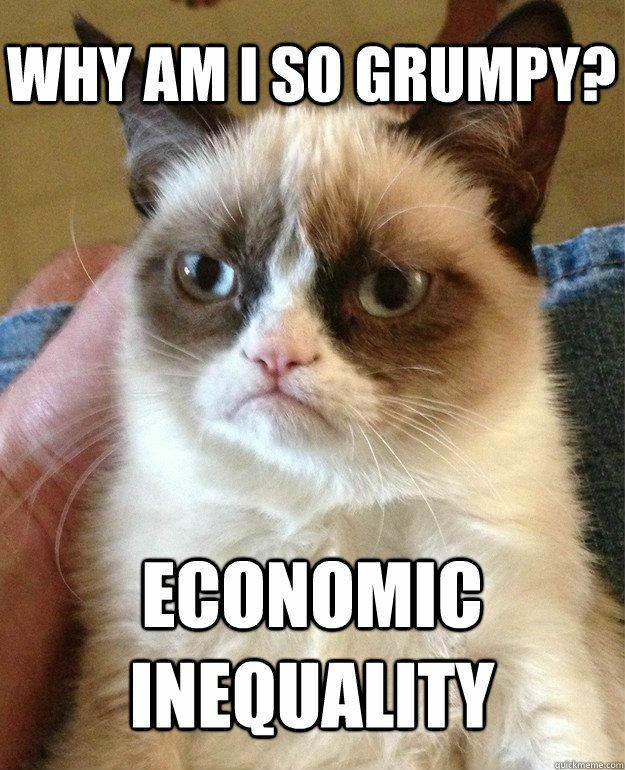 If the gap between rich and poor makes you grumpy too, you can join us in working to Close the Gap. 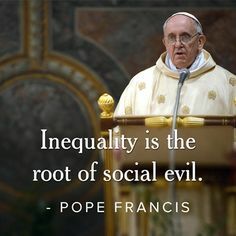 This entry was posted in A Fair Say, Benefits, Close the Gap, Fair Pay, Fair Prices, Fair Taxes, Food Fuel Finance, Partners and allies, Poverty Premium and tagged 16Oct, BAD14, Blogaction14, closethegap, inequality by Church Action on Poverty. Bookmark the permalink. What a stupid comment! Where’s your reasoning? This government cut the top rate of tax by 5% – That’s an extra 50 grand a year spending money for a millionaire yet they say they can’t afford to pay nurses properly – why? because they have given the money to those who are already rich and are laughing all the way to the bank because most of the Tories are rich themselves – that’s why! I take it you have plenty to live on by your comments? Otherwise please qualify why you think it is ‘a stupid article’ John. I think point 4 is particularly powerful. If you want to get the economy going, people need to spend more. They can’t spend what they don’t have because it’s all gone to pay the ones at the top, who have more money than they know what to do with. It’s quite simple: large pay mismatch = recession. I wish some economist would explain that to the government. Actually there’s a howling over simplification in the picture in 4 as well. Economics 101 teaches that the savings of households are recycled as investments by firms to increase production and therefore wealth nad income in the long term. 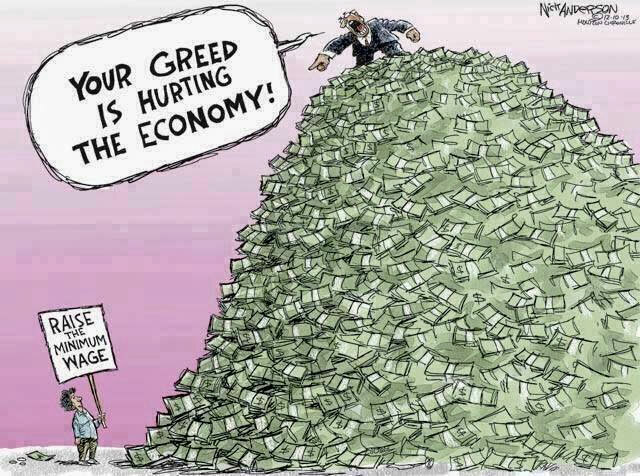 The suggestion that the rich merely ‘pile up’ their income unproductively is therefore historically inaccurate, and appears to show a lack of basic Economics knowledge – after all if no investment is occurring, then all the machinery in factories will wear out and the economy will be reduced to subsistence farming. Just at the moment there is a case for arguing that there is a shortage of investment opportunities – indicated by the amazingly low interest rates at present being charged for loans / offered for savings. This is however historically unprecedented situation – so to publish a blog failing to make some effort to explain this is surely to bring CAP into disrepute – which would be a shame. You have a useful ministry – don’t make it look foolish by getting your economics culpably wrong. Do you know what a tax haven is, and how much wealth is currently sitting unproductively in the ones owned by the UK? That’s what the picture is mainly talking about. In any case, our main point here – also based on straightforward economics, which our politicians seem not to understand – is that when the low paid receive higher wages, they spend all of their money rather than putting it in savings accounts or tax havens. That’s better for the economy. ARRRRRRRRRRGH!!!! please find somebody in your organisation to explain simple economics to you. 1) Tax havens protect the INCOME generated by the wealth of the rich from income taxes. This income accumulates because that wealth is invested in ways that generate a profit for the person putting up the capital. If it’s not invested, it won’t need to be protected from income tax. Banks lend out the money we invest in them – it’s not – despite J K Powlings – held in individual safety deposit boxes. 2) Your claim that an increase in the wages of the low paid will generate more consumption is correct – but it will reduce investment, which also serves to keep the economy going. If I buy food from the supermarket, I CONSUME what the supermarket has INVESTED in buying from the supplier. If I consume more, the producers of investment goods – such as factories – will produce less; under normal circumstances the demand in the economy will remain the same. Just at the moment because interest rates can’t fall any further this process has stalled, so VERY UNUSUALLY you MAY be right. But please don’t claim it as ‘straightforward economics’ – that it certainly isn’t. The problem with sharing this sort of ignorance is that it tars the organisation in whose name it is produced. Please find yourself someone with at least an A level in economics and ask him to check any future postings; it’s making you look RIDICULOUS – and that’s not good for a Christian organisation, there are plenty of others that do the same – and give the world every reason to ignore us.